Conservative leadership contender David Cameron has said the party needs to change its "look, feel and identity". He told the BBC's Newsnight he did not "rule out" changing its name, but did not want a mere "rebranding exercise". 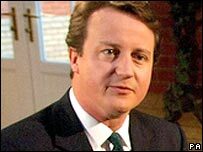 Mr Cameron, accused of changing his mind on issues, said presenter Jeremy Paxman was trying to portray every politician as "a fake and a hypocrite". He also ruled out all-female shortlists of parliamentary candidate as a "a step too far" to "political correctness". The shadow education secretary, clear favourite at the bookmakers to win the contest, was pressed by Mr Paxman over changing his mind on introducing higher university tuition fees, from being an opponent to a supporter. He said his original opposition had been because Labour had broken a manifesto commitment in bringing in the policy. Mr Cameron also said he had dropped the Conservative election pledge to bring in "patient passports", allowing NHS users to pay towards private treatment, as they could show the party "wants to get people out of the NHS, rather than improve the NHS". On the question of all-women candidate lists to increase the number of female Tory MPs from 17, he preferred "head-hunting", "mentoring" and an "A-list of candidates". Mr Cameron said he was a "believer in meritocracy and opportunity on merit". Asked whether he was a Thatcherite, he claimed he was "certainly a big Thatcher fan, but I don't know whether that makes me a Thatcherite". On religion, he added: "I believe in God and I try to get to church more than Christmas and Easter, but perhaps not as often as I should, but I don't feel I have a direct line." Mr Cameron, a former director of bar company Urbium, said he backed some reform of licensing laws in England and Wales. But extended pub hours, coming into force "just before Christmas", showed "irresponsible" timing. Mr Cameron also said he hoped to cut taxes and raise public spending, "as the economy grows". He added: "It's a promise that, as the economy grows, the proceeds will be shared." Conservative Party members are currently voting for a new leader, with the result expected on 6 December. Mr Cameron and David Davis are the candidates. The full interview will be shown on Newsnight, on BBC Two, at 2230GMT.